LOS ANGELES, LA--(Marketwired - Dec 6, 2013) - Pierre Bensusan's upcoming 40th Anniversary Tour of Europe and North America will also be a celebration of a dynamic 35-year association with his longtime guitar maker Lowden Guitars (www.georgelowden.com). 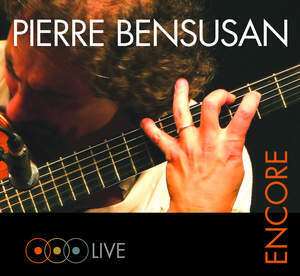 The contemporary world music and master fingerstyle guitarist (www.pierrebensusan.com) and the Northern Ireland-based manufacturer have announced that Lowden Guitars will be sponsoring the tour, which begins with 25 dates Bensusan's home country of France from January to March 2013 (starting January 30 in Paris) and includes about 40 dates in the U.S. and Canada beginning March 15. George Lowden, who is coincidentally celebrating his 40th year as a guitar maker and crafted his first guitar for Bensusan in 1978, is building a new 40th Anniversary Signature Guitar for him -- a model of which will be given away as a competition prize at the end of 2014. The contest will commence with the start of Bensusan's tour in February. Bensusan's debut album Près de Paris, released 35 years ago, launched one of contemporary world music's most extraordinary, multi-faceted careers for an instrumental guitarist and singer. The "Mozart of Guitar" has won Guitar Player Magazine Reader's Choice Award as "Best World Music Guitar Player" in 2008 and his album Intuite won the American Association of Independent Music's Best Acoustic Album of 2002. Bensusan has just released Encore, an ambitious and expansive 3-CD, 35-track retrospective collection celebrating his 40 years as a globetrotting live performer. The guitarist's name became synonymous with contemporary acoustic guitar genius, long before the terms New Age, New Acoustic Music or World Music were invented. A huge influence on fingerstyle the world over for decades, Bensusan's solo acoustic guitar work has featured use of the DADGAD tuning system and electronics. Bensusan has been widely recognized as the world master of this type of tuning. In 1978, George Lowden built Bensusan what was then called a model S22 (today, an O22), and aside from a few brief diversions, Bensusan's famous jumbo-body "Old Lady" has been his constant companion ever since. In 2009, Lowden began to work on a replacement for Bensusan's aging instrument, providing a "New Lady" for Bensusan, and leading to the introduction of the Pierre Bensusan Signature model.